CT-800 Tornador® Jar 32 oz. CT-900 Tornador® Cone with molded in Brush Replacement for the Tornador Car Cleaning tool. Lined with Stainless Steel for a longer lasting, stronger cone. Replacement Washer CT-700 Tornador® Air Reverse Switch Interior Super Soap is specially formulated for use with the Tornador Cleaning Tool. 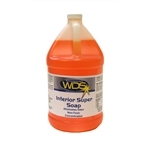 Interior Super Soap is very concentrated, non-toxic, non-flammable, VOC compliant, and contains an enzyme to help eliminate odors. Tornador Z-010 Air/Water Cleaning & Detailing Tool is air driven with a oscillating top and nozzle that creates a tornado cleaning action which tackles some of the most challenging cleaning jobs. It's quick and easy to use and works on both interiors & exteriors for faster and better cleaning which saves you time and money! Works great for cleaning hard vinyl, plastic, storage pockets, nooks, crannies, consoles, dashboards, and other hard to reach areas. The Tornador uses a unique pressurized air process to spray a mixture of water and Super Enzyme Concentrate soap onto a dirty surface. After cleaning a surface, simply turn the lever to purge air which helps dry the cleaned surfaces. 90 Day Limited Warranty The Tornado Black cleaning tool features the latest in patented "Solid Ball-Bearing Distal Rotor Technology". With this powerful pulse-cleaning technology, you can either wet or dry-clean surfaces efficiently with a neutral cleaning agent or water and save energy at the same time. Cleans carpets and fabrics, delicate areas, dash and consoles, and wheels.